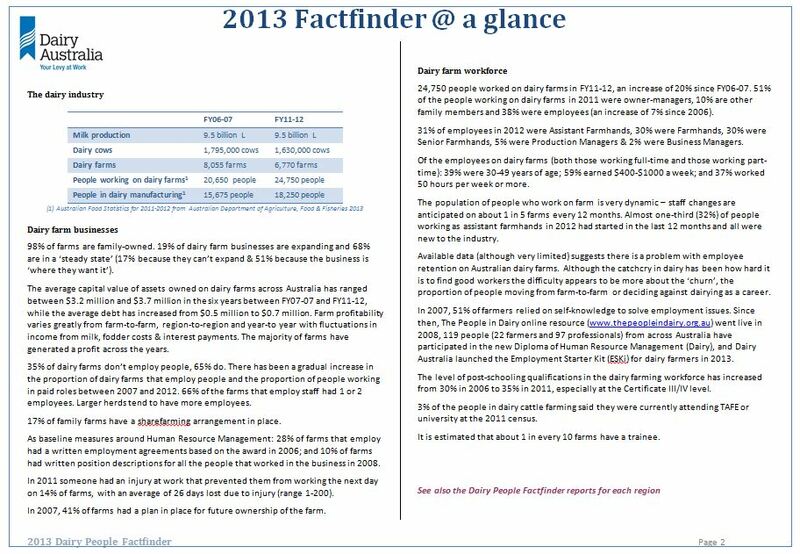 The need: Building a better understanding of the factors that influence workforce issues in regions – such as unemployment levels, demographics, regional wealth and the availability of training and services – was a main driver for the development of the Dairy People Factfinder. What we did: The Harris Park Group led The People in Dairy working group responsible for producing the first Dairy People Factfinder in 2011 and a Second Edition in 2013. Longitudinal data analyses of ABS Census data and Dairy Australia’s National Dairy Farmer Survey provided valuable insights into change over time. The working group also created a specification for obtaining a dairy-specific dataset from the ABS Census.